It’s eight o’clock in the morning and a few chalk-white clouds are stuck onto the blue sky above as café goers at Meylas sit sipping haleeb bosh (warm camel milk flavoured with honey) overlooking Al Raha Creek. The café is like an Emirati time capsule from the 1980s with its décor of time-worn suitcases, jafeers (baskets made from palm leaves), pendant lighting, vintage school chairs, antique doors, old soda bottles, stools and cassette decks. Meylas (pictured below) was opened in 2015 by young Emerati Shaikha Al Kaabi who says her vision was “to revive the beautiful old days”. 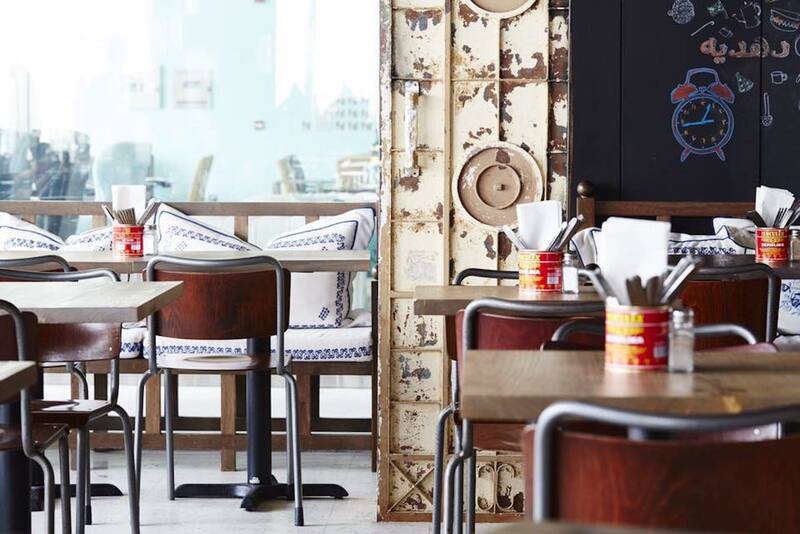 The contemporary restaurant, which feels more hipster café in Melbourne than restaurant overlooking Al Raha Creek in Abu Dhabi, serves Emirati specialties such as mohalla (traditional sweet flatbread) and salonat badu (traditional Bedouin stew). Meylas, which means “place that gathers people” is one of many new places to eat and drink that have sprung up around Abu Dhabi, helping the UAE establish itself as a destination in its own right and reinvent its status as a stopover. Today, the capital of the UAE also acts as a modern-day meylas, or meeting point, as the Middle Eastern hub cements its position as a gateway to destinations in Europe and beyond. While most of Abu Dubai seems in the midst of a renewal, the markets and souks gives visitors a glimpse into the epicentre’s history as a humble fishing village. Mina Markets is a world away from the opulent mosques and palaces: it’s where you will see fisherman hauling in their catches and locals haggling in the souk where the stalls are stacked with everything from sweet potato to fragrant spices. Lovers of street food should join locals chatting and eating at Al Shader, one of the market’s many grill stops where you can enjoy food that is both foreign and familiar: hello prawn fajitas with fattoush. Those who have a lust for travel will find there is much to do in both old and new Abu Dhabi, where the population is bulging ever bigger with global nomads. 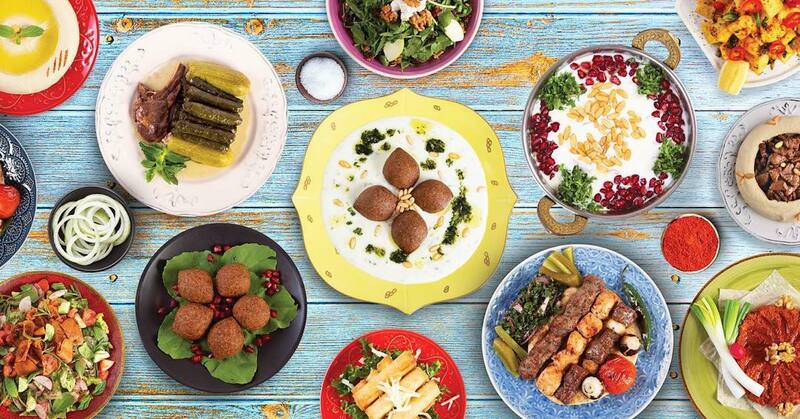 It’s an expat tradition to start the Emirati weekend with a lavish and opulent over-the-top Friday feast. 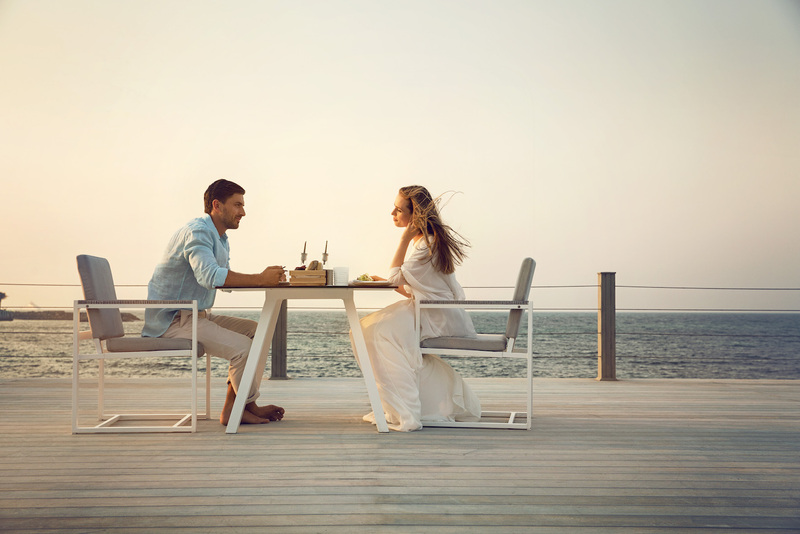 Top spots to indulge include: the Brunch in the Clouds at the St Regis Hotel and the Brunch Escape at Saadiyat Rotana. 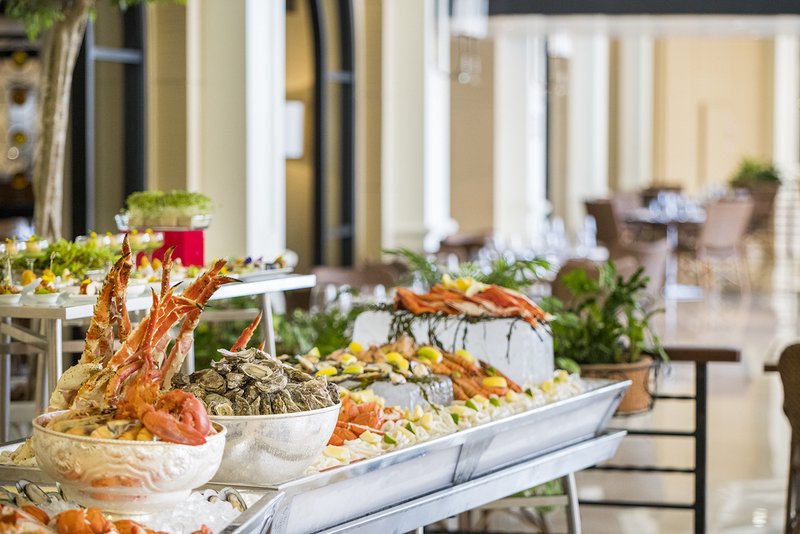 Expect expats to really unwind here as the famed brunches tend to extend into lunch and beyond with everything from sushi stations to breakfast burritos and bottomless flutes of Champagne designed to entice diners to stay and play all day. 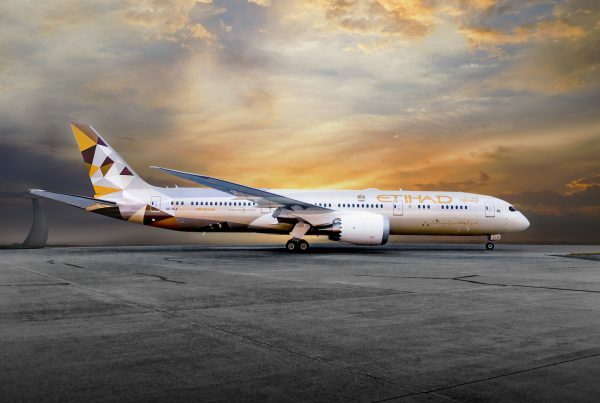 The transformation of Abu Dhabi began in the 1960s when oil was discovered, continued with the launch of Etihad Airways in 2003 – which made the city an aviation hub – and followed with the rise of tourism thanks to glittering new landmarks such as the Louvre Abu Dhabi and Sheikh Zayed Grand Mosque. Like the city itself, the UAE food and drink scene continues to evolve with experiences that range from an intimate Sunset Helipad Supper on the rooftop of the St Regis (pictured below) or an invitation to step through the doorway of an Emirati apartment to enjoy a dining experience with a local family. 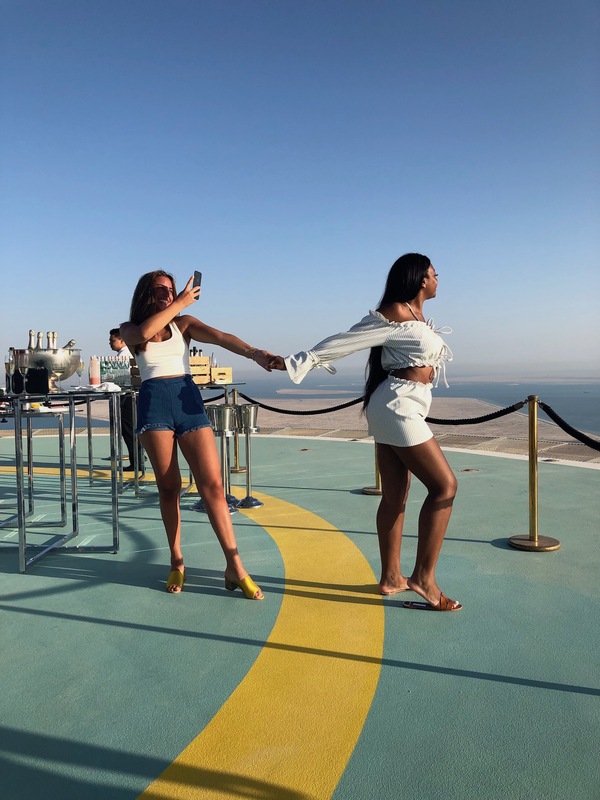 You will also feel triumphant about your decision to extend your layover in Abu Dhabi when you roll up to The Beach House Rooftop Bar, where impossibly stylish people in sunglasses gather to sip on sundowners. The bar, located on Saadiyat Island above the Beach House restaurant at the Park Hyatt Abu Dhabi, looks out over the sea, stretched like blue denim around the curves of the Persian Gulf. The nearby Buddha Bar Beach Abu Dhabi is another oasis for bar bites or pre-dinner drinks: order the lobster dumplings and a Yuhhi cocktail or two. Technip Area around Muroor Road is another one of Abu Dubai’s dynamic new dining precincts: there is Mosaic, a trendy new Lebanese restaurant with communal tables; there is La Brioche for flaky croissants; and Yadoo’s House for spiced lobster and beef salona. There’s no better place to be when dusk falls in Abu Dhabi than at a restaurant or club that takes in the glittering cityscape. Watch the sky and water as it is dyed lavender, then indigo, during a roving dinner on Al Maryah Island: start with granchio (king crab) on avocado at the crudo bar at Roberto’s followed by seared salmon fillet at Bentley Bistro & Bar and a few pisco sours at COYA. Ask any Abu Dhabi expat and they’ll tell you that strolling along the Corniche is compulsory. Visit Baskin & Robbins for an ice cream while admiring a city that truly has become an oasis in the desert and a destination in its own right. Carla Grossetti landed a sought-after job as a newspaper cadet at the age of 18 — bypassing university completely — and has been working as a journalist ever since. As a junior reporter, Carla was the office crash test dummy, putting her hand up to write stories about her weekend adventures: skydiving, white water rafting, rock climbing, bungee jumping and more. She has also travelled around the world combining her writing with her unwavering wanderlust, working in the UK, Canada and Australia and filing stories from afar. Carla plans to add a few more stamps to their passport on a trip to the Americas at the end of the year.